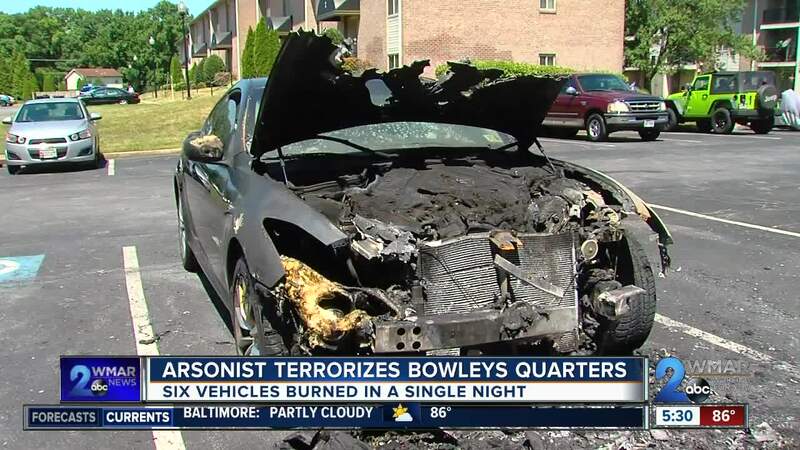 Destructive and dangerous---sporadic fires have destroyed at least 10 cars, motorcycles, and dumpsters in the last 10 days in Bowleys Quarters, and in the Seneca Bay apartment complex, Shannon Snyder has another word for it. "That's really scary,” said Snyder, “That's what I thought about the car that was sitting over there next to the other one was that it was really close to the gas tank. So that was scary." It is a concern shared by Officer Jennifer Peach with the Baltimore County Police Department. One night this week, officers responded to four different calls covering six different burning vehicles in a span of seven hours. "It's possible that if they set fire to one of these vehicles, it could explode,” said Peach, “The gas tank could explode. It could send debris. People could be injured by debris. People could be injured by fire. It could set other structures on fire. Somewhere along the line, someone's going to get hurt if this doesn't stop." But rather than slowing down, the arsonist has ramped up his crimes. What began with three fires in three days culminated a week later with a half dozen in a single night. "You've got to watch after your own stuff,” said Charles O’Neill, who also lives in the complex, “I mean if you're not keeping an eye on it, somebody is going to torch you and who it is? They don't know." While police can't be sure if this is the work of a single person or a multitude of suspects, they are convinced they are related and there's no question what's at stake should the fires spread to someone's home. "They're playing with fire. They are, and fire will burn you,” said O’Neill, “I only hope they catch them."